If you’re in the market for a smarter Dropcam, then the $249 Canary may be the connected camera system for you. If you’re looking for a more traditional home security system, I’d wait a bit longer before going with Canary — unless you’re a huge fan of DIY security and don’t mind a lot of false positives. The $249 device is an IP camera that also contains a mic, temperature, humidity and air quality sensor. It’s an attractive little product that connects to your home Wi-Fi network. You interact with it via an app on your IOS or Android device. The system has three states: armed, which means you get a notification and a recording whenever something triggers the camera; disarmed, which means you get a recording when something triggers the camera; and privacy which means the camera and mic are turned off. Basically the difference between armed and disarmed is a notification. When you receive a notification, you have the option to open the app from the notification, check the video and are then given the option of saying everything is okay, sounding an alarm or calling the police. That’s the what I mean when I call it DIY security — you are doing the work. Setting it up took me about five minutes. I popped the Canary out of the box, plugged it in where it could monitor my front entryway, and downloaded the app on my iPad. After signing up, I followed the instructions and plugged in a yellow cable that came with the Canary to securely link the Canary and my iPad via some type of audio signaling. Once I was set up, I invited my husband to download the app and we were a go. Initially, I used his iPhone 6 and my iPad with the app because the Android app didn’t come out until this week. I only tested the Android app for about 72 hours, instead of the almost two weeks I tested the Canary overall. I will note that I experienced trouble receiving notifications on the Android device when the system was armed, which is a pretty essential feature. In general, I liked the premise of the device and the camera. It has a wide-angle lens (147 degrees) that was good during the day and at night. I liked the idea of being able to monitor the air quality in my home, although in practice, it was less illuminating. For example, after the Canary had been on in my front foyer for an hour or two, it showed that the air quality in my home had gone from normal to abnormal and then to very abnormal — which was where it stayed unless I opened the windows for long periods of time. This worried me, but when I asked Canary Co-founder/Design Director Jon Troutman what was causing such a poor reading, he said that the sensor was just tracking the relative measure of air quality in my home. It should improve based on the sensor’s location and on how the sensor learns about the quality of air in my home. If over time the air quality stays the same, the level that early on gave me a very abnormal reading will default to the new normal. So far that regulation hasn’t happened, but moving the sensor to a new location helped. The system has a few little bugs that Troutman said should be fixed with a software update soon. The primary bug was that the camera sometimes stopped recording before an action was complete. For example, my camera, which was set up to record my front door, sometimes stopped recording before I’d finished entering the house. Other times, I would not get notifications in the armed state (this happened most often in the Android app, although once or twice in the iOS version) and the apps themselves would sometimes need a restart before updating. My dog, my Roomba and other benign things could trigger notifications from my Canary (more on that below). Each time I get a notification, I have the option of training the Canary by naming the objects in the video. Choices include the people who are in the system, like me and my husband; “pet movement”; shadows; reflections; people and a variety of other common items. You also can make your own categories, so I made categories for my daughter and my Roomba. At first I religiously trained my Canary, assuming that it would start learning quickly the way my Nest does. I was horribly disappointed to learn that the results of my training would take place much later. Troutman couldn’t give me a time frame more specific than “later this year” for when the existing learning algorithm would be tweaked based on the user training. I feel that a large portion of the product’s quality will rest on the quality of that learning algorithm, and I think it’s a pretty important element of the review. After all, I am getting about a dozen push notifications to evaluate a day, thanks to my pet, vacuum and random light changes. Canceling out the vacuum is easy since I know what time that runs, but the other stuff is still too many false positives to have to filter through, which makes this a poor choice for pet owners until we know how the algorithm works. As a security system, I felt that it somewhat failed because, while it (sometimes) sent me a notification when something changed in my home, it relied on me to then decide if I wanted to sound an alarm or call the police. This meant that I had to make sure I checked each and every Canary notification that came through when the system was armed to check that it was just my dog and not a burglar. Once Canary updates its learning algorithm with the results of user training, it should eventually cut down on false positives (like those caused by my dog and Roomba), and it will also offer paid monitoring plans ranging in price from $19 to $39 a month, while only the free and $9-per-month plan will require DIY security. The $9 per month plan gets you more cloud storage, if you want it. But in some ways, the tiered is the point: Having a smarter connected system down the road, but no monthly fees, might be worth the $249 price tag for many people. What if security isn’t really about a traditional alarm system, but more about being able to keep an eye on your home? That’s Troutman’s pitch, especially in the rental market, where the traditional firms aren’t event an option. I also found plenty of uses for the Canary outside of the traditional security idea from using it to alert me if the dog jumped on our bed during the day when we were out (she does) to checking to see if I brought my water bottle back from the gym (couldn’t tell). My daughter enjoyed performing little dances in front of it and telling us to check the Canary for her masterpieces. Other features that will be nice, especially for the DIYers, will be adding a phone tree to call neighbors or friends as opposed to escalating directly to the police or emergency services. All in in all the Canary I tested still feels a bit too beta for public consumption, but it does have the makings of a very smart connected camera that should make Dropcam sit up and take notice. 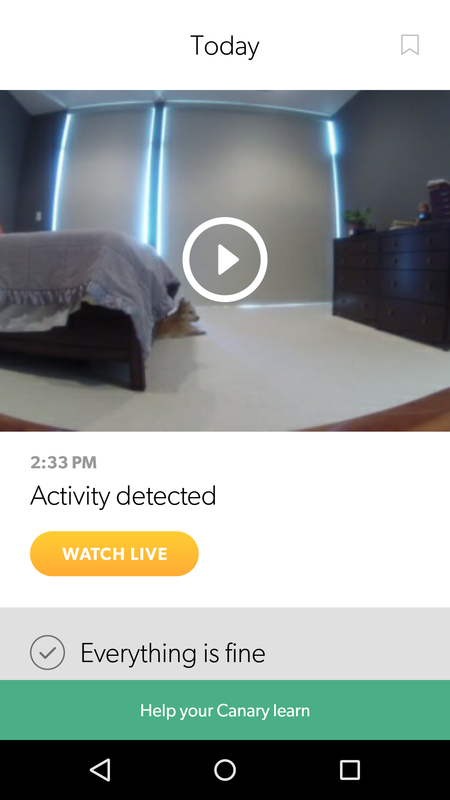 As for providing home security, I’m not really sure I felt more secure with the Canary in my home, but it did give me a chance to see what went on when I wasn’t at home. And if that makes people feel more secure, then this device could be for them. This is an engrossing home security system. There are several burglary activities takes place in The location where i live in Toronto. So since few months i was planning to install residential security system to ensure whether my house is safe or not and i can keep an eye on it through a mobile app. So thank you for sharing such a info through this blog because so long i was unaware with the fact such technologies are actually available. Inconsistent. Worked great for a few days, then stopped working. Erased all and reset device. This is a continuous issue. Often I cannot get live feed and have to reset which has to be done at the location. Tech support is abysmal, and no ‘live’ person to contact for support. Too bad…planning to return. Canary is priced right, but tech issues should have been resolved before releasing product. Just set one up. Could not find the app for my ipad air 2? Am I missing something or does it only run on the iphone? Never had a camera before, so it seems to do the trick for my purpose so far. I’ve been using Canary for a couple months now until I ended up returning it. It. Simply. Doesn’t. Work. On top of that, the customer service has been nothing short of horrendous. It’s been worse than Comcast if you can believe it. I’ve been using the system for a few weeks and it simply doesn’t work. It’s a glorified toy/paperweight. I’ve been using Canary for a few weeks now since it arrived in late January and love it – I don’t have any false alerts that concern me. As a condo owner in a high rise it allowed me to monitor maintenace staff in my unit when I’m not home without them being aware at times when I can’t be home or they have an unexpected need to enter my unit. The HD camera produces a high quality image and the night-vision is simply awesome it too produces a great image in near darkness. I have no interest in paying a monthly monitoring fee for this type of service. Not feeling the need. I am considering a WiFi camera for monitoring and simple alerts. Why would I need more if I donâ€™t have pets with the associated false positives? But, I disagree with that premise. Most newer rentals are wired/prepped for the typical Home Security system and you can basically use SimpliSafe anywhere because there is no permanent install (Everything is mounted using 3M Command strips and run off fairly long lasting batteries). As to any security system that uses Visual Detection, I say phooey. We purchased a Skybell last year and love the basic functionality, but had to turn off the motion detection because it would go off each morning at sunrise because it was detecting motion from the sun rising through the moving trees on windy days. It might be the movement of long shadows in the morning too.